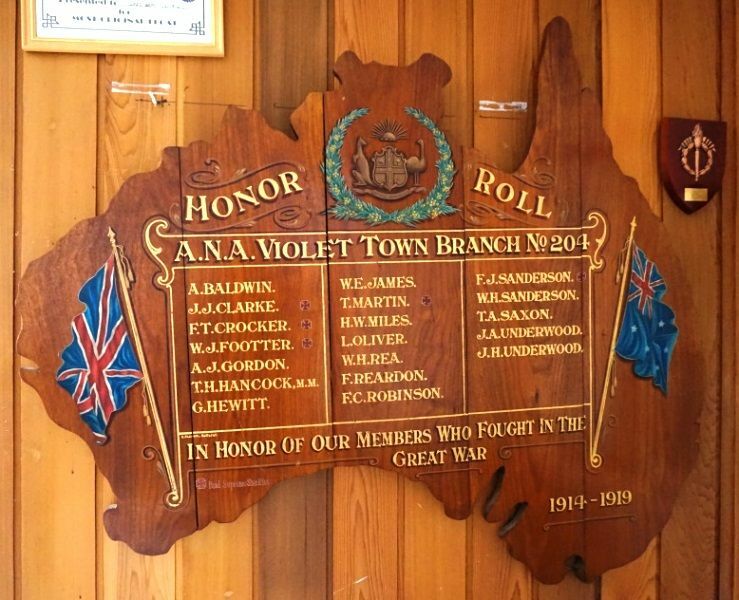 A wooden honour roll commemorates Violet Town members of the Australian Natives Association (A.N.A. )who served in World War One. The A.N.A. social which was held last Friday evening, was a great success, but owing to the rain many performers who had promised to assist were prevented from attending. 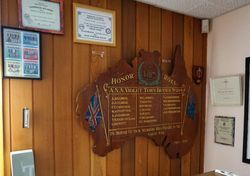 Mr. Fisher acted as chairman, and welcomed Mr. Hewison, past president of the Australian Natives' Association, who in unveiling the Honor Roll made an excellent speech. 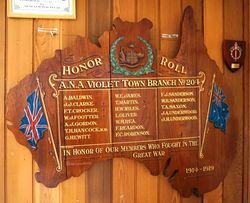 The roll is made of Australian blackwood, in the design of the map of Australia, with the Union Jack on one side and the Australian flag on the other. Above the names is the Australian emblem — the wattle, kangaroo and emu. The board on the whole reflects great credit to the local branch. It has been hung in the Mechanics' Institute. Mr. J. W. Smith (secretary of the branch) moved a vote of thanks to Mr. Hewison, which was seconded by Mr. A. Thompson (president), and Mr. Hewison responded. Miss Mary Beard sang very nicely Friend of Mine, and Mrs. Buckley, who is a newcomer, sang Ma Curly Headed Baby feelingly and had to respond to an encore, God Send You Back To Me. The hall had been nicely decorated with bunting and wattle. Refreshments were provided by the ladies. Dancing, with music by Welsh's band, and a splendid floor, was much enjoyed. Mr Saunders carried out the duties of M.C. Much credit is due to Mesdames Underwood, T. Hoskin, jun., and J. Smith and Misses Williams, Jones and Beard, and Messrs Fisher L Burden, Thompson, Halliwell, Roy Hoskin and the secretary. Mr. R. Mitchell moved a vote of thanks to the performers and all who assisted. Benalla Standard (Vic), 23 September 1921.